Built in 1909 in honour of the supreme Taoist god (the Jade Emperor or King of Heaven, Ngoc Hoang), this is one of the most spectacularly atmospheric temples in HCMC, stuffed with statues of phantasmal divinities and grotesque heroes. The pungent smoke of incense (huong) fills the air, obscuring the exquisite woodcarvings. Its roof encrusted with elaborate tile work, the temple’s statues, depicting characters from both Buddhist and Taoist lore, are made from reinforced papier mâché. Inside the main building are two especially fierce and menacing Taoist figures. On the right (as you face the altar) is a 4m-high statue of the general who defeated the Green Dragon (depicted underfoot). On the left is the general who defeated the White Tiger, which is also being stepped on. Worshippers mass before the ineffable Jade Emperor, who presides – draped in luxurious robes and shrouded in a dense fug of incense smoke – over the main sanctuary. He is flanked by his guardians, the Four Big Diamonds (Tu Dai Kim Cuong), so named because they are said to be as hard as diamonds. Out the door on the left-hand side of the Jade Emperor’s chamber is another room. The semi-enclosed area to the right (as you enter) is presided over by Thanh Hoang, the Chief of Hell; to the left is his red horse. Other figures here represent the gods who dispense punishments for evil acts and rewards for good deeds. The room also contains the famous Hall of the Ten Hells, carved wooden panels illustrating the varied torments awaiting evil people in each of the Ten Regions of Hell. Women queue up at the seated effigy of the City God, who wears a hat inscribed with Chinese characters that announce ‘At one glance, money is given’. In a mesmerising ritual, worshippers first put money into a box, then rub a piece of red paper against his hand before circling it around a candle flame. On the other side of the wall is a fascinating little room in which the ceramic figures of 12 women, overrun with children and wearing colourful clothes, sit in two rows of six. Each of the women exemplifies a human characteristic, either good or bad (as in the case of the woman drinking alcohol from a jug). Each figure represents a year in the 12-year Chinese astrological calendar. Presiding over the room is Kim Hoa Thanh Mau, the Chief of All Women. Upstairs is a hall to Quan Am, the Goddess of Mercy, opposite a portrait of Dat Ma, the bearded Indian founder of Zen Buddhism. 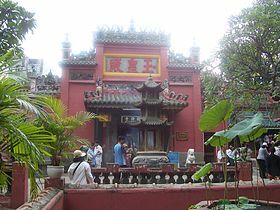 The multifaith nature of the temple is echoed in the shrine’s alternative name Phuoc Hai Tu (福海寺; ‘Sea of Blessing Temple’), whose message is clearly Buddhist. Similarly, the Chinese characters (佛光普照: Phat Quang Pho Chieu ) in the main temple hall mean ‘The light of Buddha shines on all’. Outside, a small pond seethes with turtles, some of which have shells inscribed with auspicious inscriptions.